Firstly make a marinade by crushing the garlic, oregano, lemon zest and salt to a rough paste with 1 tbsp of the olive oil in a pestle and mortar. Add the rest of the oil and mix well. Next prick the lamb all over with the point of a small, sharp knife, then rub with the marinade. Put in a sealable plastic food bag, squeezing out any air, then leave to marinate in the fridge for at least 3 hours, or overnight if you can, making sure the lamb is kept flat so the marinade can coat it evenly. Bring the lamb up to room temperature – it will take around 2-3 hours to lose the chill – then transfer to a metal baking tray. Heat the grill to very high (240°C) and cook the lamb for 15 minutes on each side, then rest it for 10 minutes. Meanwhile make the salad. Put the herbs and rocket in a bowl with the extra-virgin olive oil and the lemon juice. Toss, then season to taste. 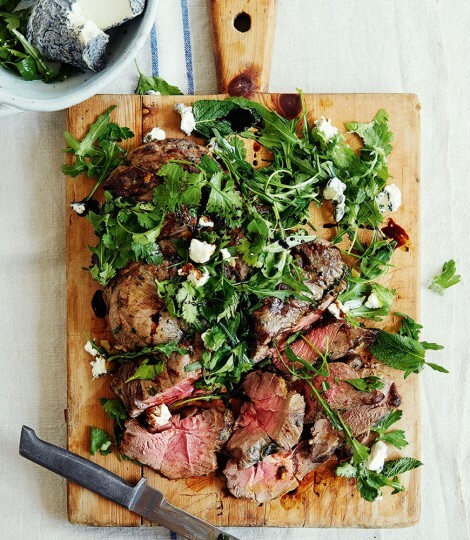 When the lamb has rested, lift it onto a large chopping board, slice thickly and scatter with the herb salad. Crumble over the goat’s cheese, then serve.